Warwickshire County Council lies in the West Midlands and has a population of around 560,000 people. The county is largely rural, with a number of urban areas based around towns such as Rugby, Warwick, Stratford-upon- Avon and Nuneaton. Warwickshire is one of the 20 per cent least deprived council areas in England, with life expectancy for both men and women higher than the national average. However around 12 per cent of children live in low-income families and there are areas of deprivation and health inequalities, particularly in the north of the county. When it moved to the county council, public health took on additional responsibilities for advocacy and Local Healthwatch. More recently the DPH became Head of Service for Public Health and Strategic Commissioning – responsible for commissioning public health, adult social care and children’s social care services, and leading Warwickshire’s Strategic Commissioning Unit. This has brought many opportunities to directly shape, rather than influence, services for adults and children so they are focused on health and wellbeing. The ethos of the unit has three key themes: prevention, early intervention and promoting self-help. Warwickshire Public Health has an emphasis on commissioning services – 87 per cent of services are commissioned, particularly from the NHS and the voluntary, community and social enterprise (VCSE) sector. Public health consultants and commissioners are embedded across three commissioning teams – children, older people, and disabilities – which includes mental wellbeing and dementia. integration and working together across the system. 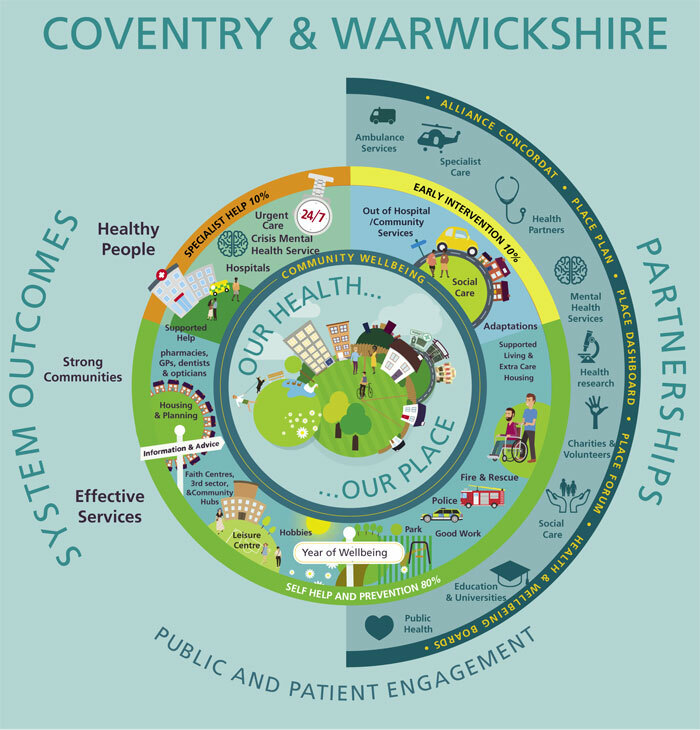 The STP – Better Care, Better Health Better Value – covers Coventry City Council and Warwickshire, and the DsPH are co-leads of the Preventative and Proactive workstream. Coventry and Warwickshire HWBs have formed a joint Place Forum which considers system-wide activity relating to health and care integration and prevention. Forum partners have agreed an Alliance Concordat setting out principles and priorities for how they will work together. See case study in forthcoming LGA report on HWBs working together in the new NHS landscape. Warwickshire JSNA has been revised to take on a place-based approach focused on 22 geographic areas with a population of between 30,000 and 50,000. Each area will have a detailed needs profile incorporating the views of local communities. The JSNA will support the work of districts and boroughs and system-wide integration and prevention. A Health, Wellbeing and Integrated Care Partnership has been operating in Warwickshire North since 2012. The partnership involves county and district councils, the NHS, the VCSE sector and other partners, and has a local health and wellbeing strategy and an outcomes framework. The partnership has been widened to include local NHS providers and is now looking to how it might form one element of the future ICS – integrated local teams combining to deliver primary, community and wellbeing support in local hubs. The teams would encompass social prescribing, home care, the frailty pathway, MECC, community development and wellbeing initiatives such as tackling teenage pregnancy. Similar models have now been developed across the rest of the county – Rugby and South Warwickshire. These partnerships are sub-committees of the HWB. The DPH’s wide commissioning role brings important opportunities to place prevention at the heart of integrated services. The challenge is that managing this span of control, with a team increased from 26 to 130 people, means there is less time for the informal influence role of the DPH. Reductions to funding are the biggest challenge – not just for public health but in the wider council and its partners. When public health transferred to the council, the grant meant that it was able to expand into areas in which it had previously had less input, such as mental wellbeing, dementia, suicide prevention and domestic violence. This is becoming increasingly difficult to sustain. Public health has a focus on return on investment and building sound business cases for interventions and has made savings through effective commissioning. It also shares costs, for example through joint posts funded with the NHS. There is some potential for further savings, such as reducing management costs through future consolidation and re-tendering, but this will be limited. The impact of reduced funding is likely to be an increased focus on mandated services. It is not possible to go on cutting services without impacting on quality and some clinically governed services, such as in sexual health, need to be maintained at the appropriate level. There are many areas which public health and partners could develop or scale up with additional funding. These include extending exercise on prescription beyond a small pilot for people with cancer; further developing the health and wellbeing potential of leisure centres; and a comprehensive, joined-up offer for mental wellbeing. Public health has brought a wealth of knowledge and values to local government and we are working to make sure that these are thoroughly embedded so all can play their role in promoting health and wellbeing and reducing health inequalities. This applies to council departments, districts and boroughs, and the health and care integration agenda. Warwickshire’s boroughs and districts are valued partners in improving health. I chair a group of leaders from the five second-tier authorities in which we work together on health and wellbeing initiatives. A good example is the development of a county-wide homeless strategy based on wrap-around support so that all services are involved in supporting people who are homeless. Initiatives include South Warwickshire Hospital identifying homeless people or those in danger of losing their homes in A&E, and a new 22 bed hostel in Warwick which has already helped several people get back on their feet. Another important partnership is the Joint Health and Wellbeing Board – Place Forum – set up with Coventry City Council across the STP footprint. An Alliance Concordat for how the councils, health and other partners will work together has been signed, and the Forum is taking practical steps to take forward prevention in the STP together, including supporting the 2019 Year of Wellbeing. With so much attention nationally on the importance of prevention, it is annoying that at ground level, where we can make a real difference, the public health budget for councils is being cut and there seems little consideration given to funding local government to develop prevention to make health and care services sustainable. Warwickshire operates a comprehensive portal approach to provide information, signposting and opportunities for referral to health and wellbeing services. The Health and Wellbeing Portal is a regularly updated directory of information for practitioners from health and care and the VCSE sector, including those involved in social prescribing and the Making Every Contact Count (MECC) programme. The portal provides access to information on advocacy, alcohol and drugs, children and young people, healthy eating, housing and benefits, mental health and wellbeing, physical activity and weight management, screening, sexual health and relationships and stop-smoking. There is also a public-facing portal which provides detailed information about the main ways of improving health, including campaigns, and how to access support. Beneath the portals are a range of health and wellbeing initiatives and services. Warwickshire has a comprehensive approach to supporting people with dementia, outlined in its Living Well with Dementia Strategy. The dementia portal provides information about carer support and living well with dementia. It also includes an online space for people to ask questions or share thoughts, and a navigator service run by the Alzheimer’s Society. general awareness-raising programmes with the general public. Warwickshire intends to further upscale and roll out these initiatives to provide greater support to the increasing number of people with dementia and their families. young people and adult physical activity/ healthy lifestyles on referral (exercise on referral). Fitter Futures is evidence-based and targeted at people most in need of maintaining a healthy weight. It is provided in areas where there are high levels of obesity. Access to the services is generally through professional referral and involves eligibility criteria such as BMI weight or a medical condition such as risk of diabetes or respiratory problem. Referrals to Fitter Futures have increased every quarter since it was established in 2015 and people who complete the programme achieve positive outcomes, with improvements to healthy weight, physical activity, emotional wellness, and fruit and vegetable consumption. Other positive impacts include reduced medication, increased self-confidence and improvements in health conditions such as diabetes, respiratory problems and musculoskeletal conditions. adult weight weight management – 3231 individuals. The North Warwickshire Health and Wellbeing Partnership has been working since 2012 to reduce premature death through cardiovascular disease. A thirty-point plan was developed with actions that included an increased focus on stopping smoking; better diagnostics; mini health checks in markets and community centres; and training people in CPR and healthy heart awareness, including 5000 secondary school pupils. Smoking in pregnancy rates in the north of the county were up to 25 per cent – higher than the Warwickshire and England average. Rates have now reduced to 14 per cent, which is lower than the national average. Overall, premature deaths in the area reduced from 152 in 2012 to 135 in 2017. This campaign provides online information to get people to pledge one healthy change to their lives, such as giving up desert or smiling more. Thousands of local residents have made pledges, and a large number of success stories have been recorded and used to help promote the programme. 95 per cent reported improved wellbeing. The service is commissioned by the county council and is free to all Warwickshire residents. Homelessness and rough sleeping have increased in Warwickshire, and the 2017 DPH annual report highlighted that homeless people die on average 30 years before the general population. In 2018 the council invested £300,000 for a two-year programme of work focused on homeless people with mental health, drugs and/or alcohol problems. The council is working with districts and boroughs, NHS partners, the police and the VCSE to develop the programme, which will include part-funding a local hostel. An Air Quality Alliance has been established across five districts with air quality problems, involving public health, Environmental Health and PHE. The five districts are currently consulting on inserting supplementary planning guidance on air quality as part of their planning frameworks, which would mean that measures such as active travel would be an automatic consideration in planning applications. get people talking in order to reduce loneliness and social isolation, particularly in older people. Developing preventative approaches with children and young people is a priority for the Strategic Commissioning Unit. Warwickshire School Health and Wellbeing Service combines school nursing and a wide range of preventative support to children age 5-19 years and their families. The team operates via open access clinics or group sessions in schools, and also runs support programmes in youth centres, community centres and other community settings. A key part of the work is engaging with students and teachers to understand wellbeing and resilience and promote it through everyday activity and peer support, so schools become healthy places. Warwickshire is developing services that operate seamlessly together and intends to commission integrated 0-19 services in 2020. The DPH is programme chair for the Children’s Mental Health Commissioning Board which is working to encourage resilience and good mental health to avoid the need for more intensive services, such as child and adolescent mental health services (CAMHS) which have significant waiting times. The new CAMHS service, RISE, is a partnership between the local Mental Health Trust and a VCSE organisation. The focus is on prevention, early intervention and promoting self-care, and the service has had notable success in reducing waiting lists and times, engaging with schools and families, and using community assets to help deliver support. It is important to have a clear vision which is translated into practical, achievable objectives so people know whether progress is being made. Public health needs to keep looking for opportunities and be prepared by having projects on the ‘back burner’ for when funding or other opportunities arise. Public health needs to keep articulating a clear case why continued investment in prevention is important – improving population health and wellbeing will, in many cases, lead to a reduction in demand.